Summary: Set in pre-Civil Rights Mississippi, Miss Hazel and the Rosa Parks League is the story of two young mothers, Hazel and Vida – one wealthy and white and the other poor and black – who have only two things in common: the devastating loss of their children, and a deep and abiding loathing for one another. 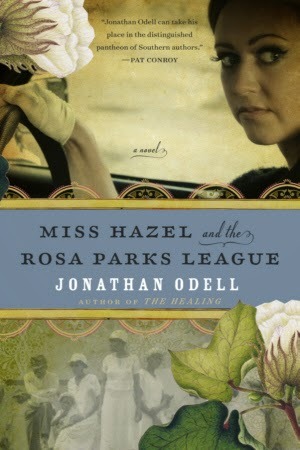 I am way behind on reading but I wanted to share MISS HAZEL AND THE ROSA PARKS LEAGUE by Jonathan Odell sooner rather than later. I plan on starting this book later this week, but since the book is released today, I didn't want to wait to tell you about it. MISS HAZEL AND THE ROSA PARKS LEAGUE sounds like Southern fiction at its best... and it's set in one of my favorite time periods pre-Civil Rights Mississippi. The characters sound interesting and I have a feeling that this novel is going to explore this time period like few books do. I can't wait to read it! I am so happy that I have a copy of MISS HAZEL AND THE ROSA PARKS LEAGUE to share with one lucky reader. To enter, just fill out the form below before February 17th at 11:59 p.m. EST. I will randomly select and notify the winner the following day. This contest is open to those of you with U.S. addresses only. Good luck! I have this book too, and I'll be reading soon. The author is visiting my favorite Indie later this month, I can't wait to meet him. I feel so behind in reading/keeping up with my arcs...one day at a time! This one sounds good! I just added it to my TBR. Hope to get to it sooner rather than later!